MediaShed is the first "free-media" space to open in the east of England. It's a place wheremembers can come hang out, learn, propose some training, create and propose new projects using free-media or show things they have made on one of our screening nights. The MediaShed is designed to be as open and accessible as possible, welcoming. One of their projects are making surveillance camera movies. 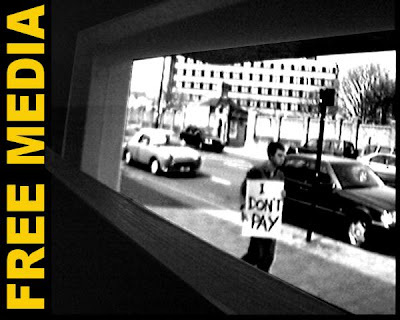 Free-media: is a freebie - doesn’t cost much, especially to the people who need it most and can afford it the least; doesn’t cost much because it makes use of the public domain, Free and Open Source Software (FOSS) and recycles freely available old equipment, waste materials and junk; sets you free by giving you the ability and confidence to do things for yourself, promoting independence, self-reliance and the exercising of free choice; is media that is open, transparent, unrestricted and outside proprietary controls, so you can freely change it, rewrite it or rebuild it to suit yourself; supports the free exchange of ideas and opinions to help build a more democratic society; is free to help you when you need support, advice, are looking for someone to collaborate with or just fancy a chat; The MediaShed now has over 100 members and has run workshops, several screenings and exhibition events and completed its first public project “Video Sniffin” for the “Being Here” event in April.